How do you research experiences of people living on the economic margins? Ask UC Santa Cruz student Andres Arias (Oakes, 2016), a double major in Latin American and Latino studies and sociology. Arias has immersed himself in California migrant communities to conduct original research about this vulnerable and often voiceless population. Aries will present some of these findings at “No Place Like Home, The Santa Cruz Affordable Housing Crisis Study,” a public event Oct. 13 at the Museum of Art and History in Santa Cruz. The research, led by sociology professors Miriam Greenberg and Steve McKay, grows out of “Working for Dignity,” McKay’s previous study about low-wage workers in Santa Cruz County. From Santa Cruz to Los Angeles, Arias explored issues surrounding migrant work with an emphasis on low-wage jobs and the informal labor market. His interest in labor studies began in 2015 through a research apprenticeship with McKay. At the time, McKay was spearheading his two-year Working for Dignity study in collaboration with the Center for Labor Studies, the Chicano Latino Research Center, California Rural Legal Assistance, and the Community Action Board of Santa Cruz County Day Worker Center. Every weekend, Arias would travel with fellow undergraduates across Santa Cruz County to interview subjects for the project. Often driving the 15-passenger van himself, Arias and fellow undergraduate researchers visited farmer's markets, public events and plazas, grocery stores, and coin laundries. At times they went door-to-door to talk with low-wage and undocumented workers about their working conditions. “There was an instant connection with the person I would interview,” Arias remembers. Like many of his research subjects, Arias was raised in a low-income household and knows first-hand the problems associated with low-wage work. Like many of his research subjects, Arias is also undocumented. 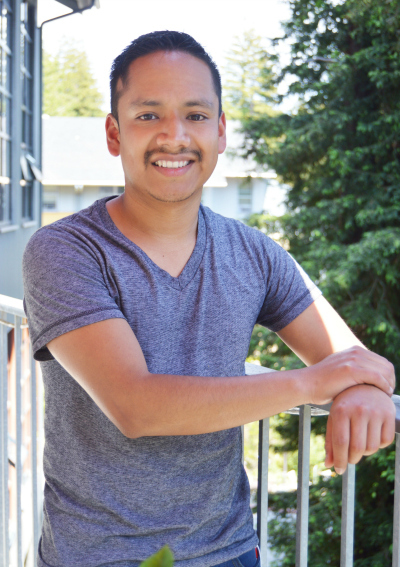 Arias is one of UC Santa Cruz’s Dreamers, a group of undocumented students who can attend college thanks to California Dream Act. The act is a combination of three bills, AB 540, AB 130 and AB 131 that allow undocumented students who meet certain requirements to be treated the same as resident students. “Informal labor is part of my family,” says Arias. Job insecurity, wage theft, tip stealing, no break times, harassment, discrimination, and even retaliation against workers who spoke out about poor and unsafe working conditions were some of the many problems Arias and other researchers discovered. In McKay’s class, Arias developed the skills required to conduct his own research about Latino street vendors in Los Angeles. He wanted to know more about the impact of L.A.’s strict anti-street-vending regulations. Despite laws against this type of work, he discovered that migrant Latinos continue to sell consumable foods from metal grocery pushcarts. “What my work aims to engage is the dignity street vendors find in so-called ‘illegal work’ they perform in public spaces in the city,” he writes in his senior thesis on the project. To learn more, Arias embedded himself for six weeks with the community to learn about the risks and vulnerabilities of selling homemade churros, fruit cups, corn on the cob, and shaved ice with flavored syrup—all illegal work, according to city regulations. Arias observed vendors’ fear of being arrested, high debt, and social danger. He heard stories of private security firms causing terror and an elderly woman robbed of her earnings at the end of a day. He even witnessed a police crackdown on an older woman selling slices of fruit—a moment that defined his research project. After the police took the seller’s pushcart and product away, Arias followed her to see what she did next. Instead of seeking consolation that he had expected, she sought out new street vending supplies and started over, even returning to the same spot later that day. “This vignette reveals the questions at the heart of this research project: under this punitive environment, what is the moral economy of informal street vendors?” Arias noted. “Andres Arias has really excelled,” said Pablo Reguerin, assistant vice provost for student success and director of the Educational Opportunity Programs (EOP). Reguerin observed Andres successfully advance in the EOP Pathways to Research (P2R) Program where he worked with him as a mentor. Arias’ perseverance and scholarship has earned him the The Fanny Carruthers Award in Sociology two years in a row. This summer, Arias was also invited to present his research in Seattle at the American Sociological Association’s Honors Program for undergraduate students. “Andres is an example of the power of giving students an equal opportunity to succeed,” Reguerin said. No Place Like Home is a campus-community event to showcase the findings from a multimedia research project on the affordable housing crisis in Santa Cruz Thursday, Oct. 13 at 7 p.m. at the Santa Cruz Museum of Art and History, 705 Front St, Santa Cruz, CA 95060. Students and community members will share their stories, testimonies and artwork about creating a sense of "home" during a housing crisis.